This process follows the process to setting up your suppliers with products they will need to update. To begin, select your partner you plan to setup products for. Sending a product update to your partner will first involve setting up a link between your SupplierSKU and the MerchantSKU. 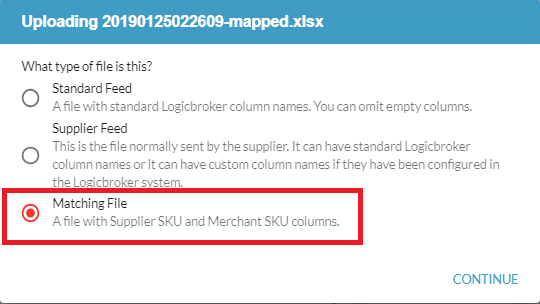 Creating this link for each item will allow you to send inventory updates with only the SupplierSKU and will automatically match and update the quantity for that product and retain the MerchantSKU, even if it wasn't provided in the update. This is done to prevent sending products that are not setup your system. In this way, the process is separated so that any new products available to be updated via Inventory feed will need to be setup using this matching file first. This will allow you to send all products in your inventory updates and only products that will update are ones that have been setup previously. You can also view a list of your unmatched products by going to Download Files and downloading the Unmatched Items CSV or XLSX. If Ignore unmatched under Feed Settings is set no unmatched records will be kept. To avoid the setup process of products with the matching file you can set the Auto match option under Feed Settings. This will allow you to submit all inventory feeds using your standard feed and any products not matched will automatically get created with the MerchantSKU matching the SupplierSKU provided. This should be used in cases where the MerchantSKU is the same as the SupplierSKU or it is not required to provide the MerchantSKU or it is provided in another field. The MerchantSKU can only be set to a different value then the SupplierSKU through the matching file. Setting up your matching file begins by downloading the Standard Feed and populating the MerchantSKU and SupplierSKU fields. No other data will update when submitting the matching file. Once your prepared your file, you can upload it and select Matching File. To automate the process of setting up products for inventory there are 2 options. You can integrate using SFTP/FTP or through the API. In both scenarios, the format will be the same using a standard CSV or XLSX file with the columns SupplierSKU and MerchantSKU. **The <PartnerAccount> will be your supplier's Company ID. This can be retrieved by navigating to Suppliers in the portal; the CompanyID will be shown under each supplier. To integrate using the API please follow these instructions in the Retailer Inventory section on our developer site.